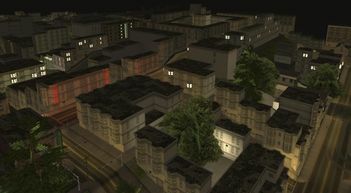 Calton Heights is a district of San Fierro, San Andreas. 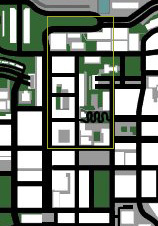 It is situated toward the north end of the city, with a portion extending all the way to San Fierro Bay. To the west are Juniper Hollow and Paradiso; to the east are Financial and Downtown; and to the south is Chinatown. Modeled after San Francisco's Pacific Heights, Calton Heights, like Pacific Heights, is situated on one of the highest points in the city. More importantly, however, Calton Heights is the most affluent part of town, boasting a great number of rather grandeur and expensive residences. Residents are what one would expect from such an affluent place; they are well-dressed, and they would feel as if they were rather more superior then the other denizens of San Fierro. Calton Heights is the location of one of the most expensive houses that are available to buy as a safehouse in Grand Theft Auto: San Andreas, weighing in at a whopping $100,000. This modestly appointed structure sits atop one of San Fierro's most famous landmarks, Windy Windy Windy Windy Street, which is modeled after San Francisco's Lombard Street (known as the "crookedest street"), despite the real landmark not being located in Pacific Heights. Numerous alleys throughout Calton Heights provide countless opportunities for snatching expensive automobiles (and the occasional weapons spawn or police bribe) outside of the watchful gaze of the police, who frequent the streets of this district in respectable numbers. Calton Heights is also a territory of the San Fierro Triads, a local gang. A great number of Triads are seen patrolling this area, whether it be on foot or on their respective gang vehicles. Their surprisingly gentle mannerisms and peculiar politeness belie the fact that they guard their territory fiercely, and will not hesitate to shoot (often with AK-47s) at anyone engaging in carjacking or other criminal behavior on the streets of Calton Heights. Parked at the Burger Shot northeast of the district, just across the Pay 'n' Spray in Juniper Hollow, one of the rare parked vehicles spawning with a custom plate, this one's reading "CHUNKY". At the top of the staircase on the westernmost side of Windy Windy Windy Windy Street, just north from the Calton Heights Safehouse. On the south side of the street one block to the northwest of the safehouse, behind the row of garages. Down the southern staircase on Windy Windy Windy Windy Street, below the safehouse, two flights down. On the western side of the church in northern Calton Heights (in the parking lot). In a sloped alley between buildings at the north end of Calton Heights. This page was last modified on 27 July 2012, at 14:40.